There are 3 main types of batteries you can get into today's market for your Alternative Energy System. These 3 are AGM (Absorbed Glass Mat), Gel Cell(Sealed), and Flooded Lead Acid batteries. AGM (Absorbed Glass Mat) - AGM Batteries basically consist of fiberglass mat material that is absorbed with sulfuric acid. These AGM Batteries are sometimes also refered to as "dry" cell batteries because of the little electrolyte or other liquid in them. 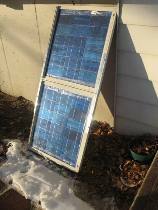 The AGM is one of the top choices for an Alternative Energy system because of it clean use. AGM batteries can be shipped without any hazourdous material worries, and also these batteries will not spew out acid even if the cases are broken. The only real downfall of AGM Batteries is that they cost 2 to 3 times as much as the lead acid type batteries. Gel Cell (Sealed Lead Acid Batteries) - These sealed batteries are normally found in your "battery backup" power units, like the ones to protect computer network systems. These Gel Cell batteries are used where you will not be able to vent them, or maybee they will not be able to be mounted in the upright position. Gel Cells although good for non-vent and non-upright pos. are not good for long discharges, and are very temperature sensitive these cells must be used with a voltage regulated sensing charge controller. Flooded Lead Acid - There are 2 main types of Flooded Lead Acid Batteries. One called a Shallow Cycle, which is most commonly used in car starting applications. Also one called a Deep Cycle which is one that is used in Marine, RV, and Deep Cycle conditions. --- Shallow Cycle - A shallow cycle battery is typically use in automobiles and utility vehicles. 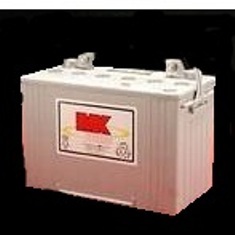 These shallow cycle batteries, basically are made to put out a large amount of current in a short period of time. Also to note these batteries are usually ones rated in CCA (Cold Cranking Amps). --- Deep Cycle - Deep Cycle batteries are typically found in electric golf carts, rv's , and other deep cycle conditions. This is the type of battery that we will be using in our system because we want a longer drawn out amount of current for use in running equipment. Deep Cycle Batteries are normally rated in amp-hours, or a minute figure. 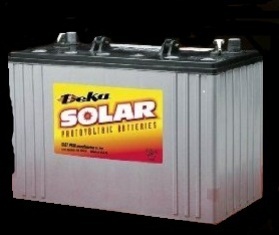 On most deep cycle batteries you will see for example a 220amp hour rating(in our case). This amphour rating is normally rated for 20 Hours. So for example our batteries should be able to put out 11amps for 20 Hours equalling 220amp hours. Although you have a reserve capacity of 220amp hours it is reccommended for longevity purposes to only discharge your batteries down to 80% capacity or 20% discharge, so you need to size your battery bank accordingly. 6 volt Flooded Lead Acid Deep Cycle Batteries. These specific ones are 6 volt Golf cart batteries, normally arranged in a 36 volt fashion to drive a 36 volt electric motor.